Preheat oven to 225°F. Cut baked Pillsbury™ French Bread loaves into 3/4-inch cubes. and spread on a clean baking sheet. Bake 30-40 minutes, or until bread is dried out and crisp. Spray a 4-5 quart slow cooker with non-stick baking spray. Place the dried bread pieces into your prepared slow cooker. In a blender, combine milk, eggs, cream, vanilla, cinnamon and maple syrup. 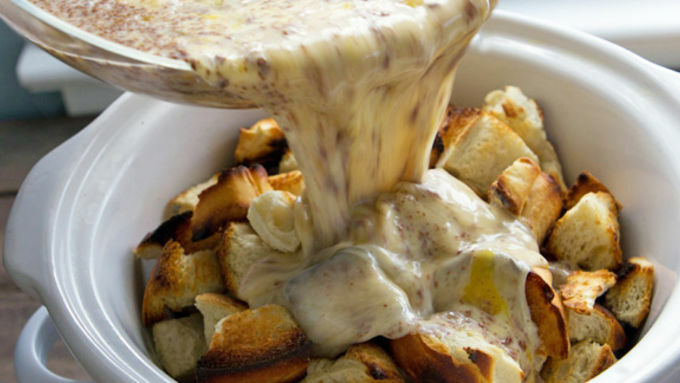 Drizzle entire mixture over the bread in the slow cooker. 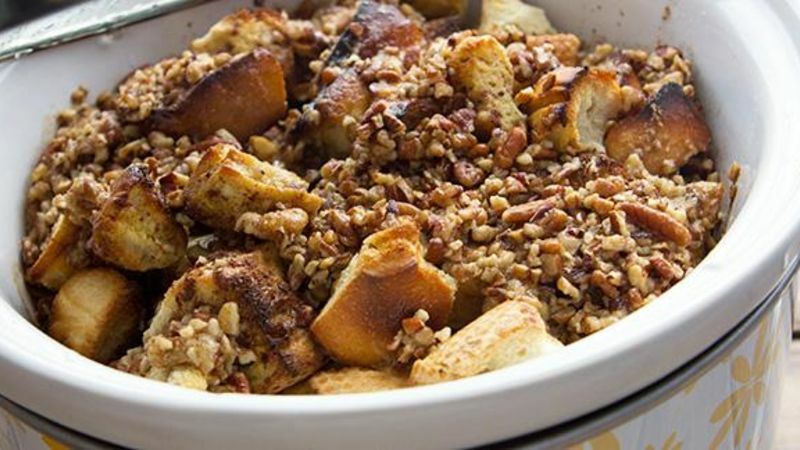 In a small bowl, use a fork to combine the brown sugar, butter, and nuts.Sprinkle mixture over the top of the bread. Cover and cook on Low setting for 4-5 hours. 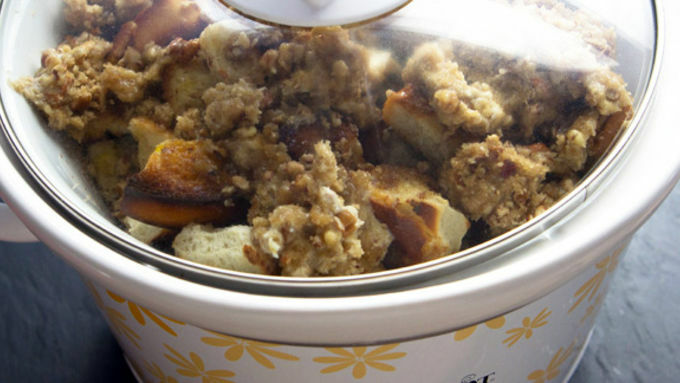 Twenty minutes before serving, remove the lid of the slow cooker and allow the French toast to cool and set. Serve with fresh berries and a drizzle of maple syrup, if desired. Slow cooker French toast? Say whaaat? 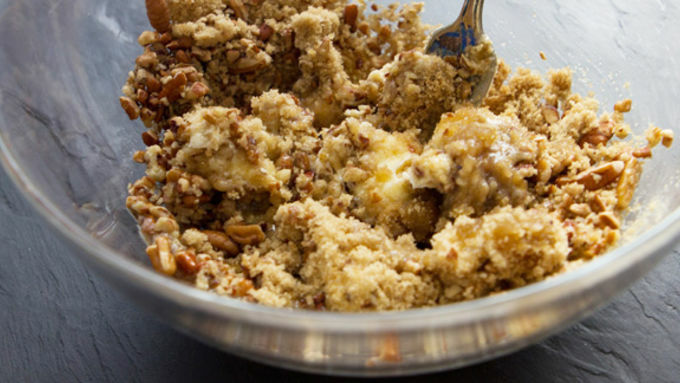 This breakfast recipe is so good and so easy, it'll become an instant favorite. Come take a stroll down Storytale Lane as we walk you through the recipe and right into the belly of breakfast. Once upon a time, you nabbed yourself two cans of Pillsbury French bread dough. Good shopping. Now, bake it all according to package directions, cool and cut into cubes. 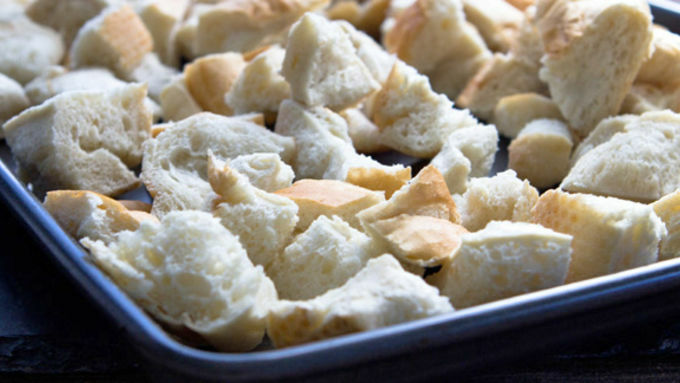 Toss those cubes of bread onto a baking sheet and pop 'em into your oven, which shall need a heating to 225°F. Basically, you're just drying the bread into breadcrumbs (well, croutons, but bear with us). It's a Hansel and Gretel thing. It's a French toast thing. Breadcrumbs are required for fables and French toast. You're heretofore ready to eat breakfast or head into the woods and escape evil stepmothers. You're welcome. If'n you do decide to head into the forest, you'll likely discover a gingerbread house that smells like cinnamon and is coated in this crazy awesome vanilla creme mixture. Also required for French toast. Total serendipity. Take a note from the Gingerbread Witch and mix everything together in your slow cooker. Then take a note from general awesomeness and top it off with a butter-brown sugar-pecan mixture. This is the stuff of storytelling! Lid on, low setting. You now have four hours to curl up with a book or nibble on the gingerbread house. Because once this French toast casserole starts cooking, it makes everything smell like vanilla and hunger. Ding! After four slow and scrumptious hours, it's done. Just lift the lid and sniff. Ahhhhhh. Yummmmmmy. Drizzle with maple syrup and tuck up close to the table. Closer. Closer. Mmmmm. That's just right.